A chum (pronounced "choom") is a temporary dwelling used by the nomadic Uralic (Nenets, Nganasans, Enets, Khanty, Mansi, Komi) reindeer herders of northwestern Siberia of Russia. The Evenks, Tungusic peoples, tribes, in Russia, Mongolia and China also use chums. 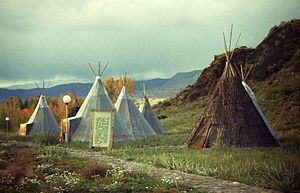 They are also used by the southernmost reindeer herders, of the Todzha region of the Republic of Tyva and their cross-border relatives in northern Mongolia. It has a design similar to a Native American tipi but some versions are less vertical. It is very closely related to the Sami lavvu in construction, but is somewhat larger in size. Some chums can be up to thirty feet (ten meters) in diameter. The traditional chum consists of reindeer hides sewn together and wrapped around wooden poles that are organized in a circle. In the middle there is a fireplace used for heating and to keep the mosquitoes away. The smoke escapes through a hole on top of the chum. The canvas and wooden poles are usually quite heavy, but could be transported by using their reindeer. 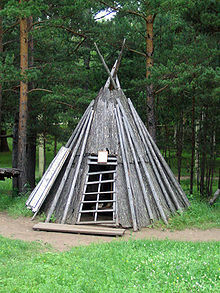 The chum is still in use today as a year-round shelter for the Yamal-Nenets, Khanty and Todzha Tyvan people of Russia. In Russian use, the terms chum, yurt and yaranga may be used interchangeably. The word chum (Russian: чум) came from Komi: ćom [t͡ɕom] or Udmurt: ćum [t͡ɕum], both mean "tent, shelter". In different languages it has different names: Nenets: ḿāʔ [mʲaːʔ], Nganasan: maʔ, Khanty: (ńuki) χot. Evenki: ǯū [d͡ʒuː]. ^ Vasmer, Max (1986–1987) [1950–1958]. "чум". In Trubachyov, O. N.; Larin, B. O. (eds.). Этимологический словарь русского языка [Russisches etymologisches Wörterbuch] (in Russian) (2nd ed.). Moscow: Progress. Wikimedia Commons has media related to Chums.